At Kinglake Homestead we offer accommodation agistment for horses and a range of facilities for their owners and riders. Stables are available and space is provided for owners to store feed and equipment, to saddle up indoors and groom care for horses undercover and under lights after a late ride. A wash area is provided, and farriers and vets are able to drive into the shed to attend to animals. There are a number of farriers, vets and other animal care professionals that operate in the Kinglake area. 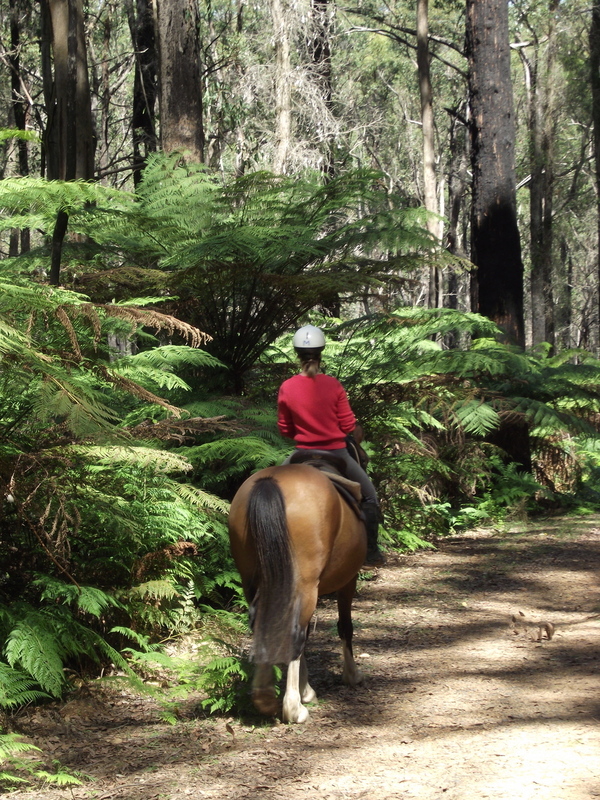 There are magnificent riding opportunities in the Kinglake National Park which commence 30 meters beyond our road entrance, offers unlimited trail riding. Kinglake pony club and adult riders is located a about 10 minutes from the farm. The farm has a number of paddocks that are dedicated to agistment horses, and others set aside for our Trail Ride horses which are kept separate at all times. Usually we operate shared paddock arrangements with two, three or four horses together, with two paddocks allocated to cycle between throughout the year. In normal years’ natural pasture can be expected to maintain horses from November through to March, with supplemental feeding commencing in April, continuing through the winter, and tapering off in October. This of course, is greatly affected by the nature of the horse and the amount of work that is expected of it. Agistment is only available to mares and geldings, entire males are not permitted. For the riders, there are toilets, shower, kitchen and lounge facilities and BBQ's available for use without additional charge, with accommodation available subject to bookings. National Park Hotel in Kinglake Camp; Glenburn Hotel both offering meals within riding distance.